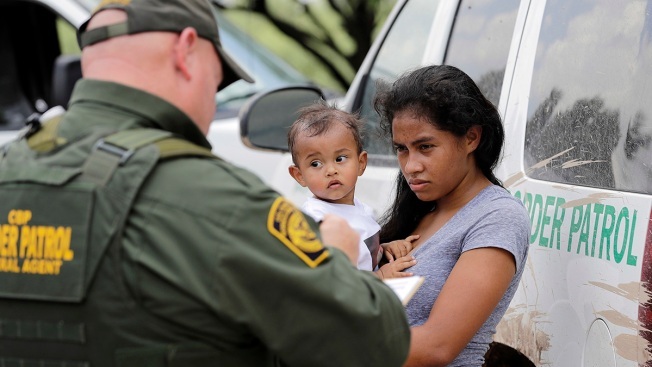 In this June 25, 2018, file photo, a mother migrating from Honduras holds her 1-year-old child as she surrenders to U.S. Border Patrol agents after illegally crossing the border near McAllen, Texas. The Trump administration may have already deported as many as 463 migrant parents who were separated from their children at the U.S.-Mexico border, and they may have lost their right to reunification, Justice Department lawyers said in a court filing Monday. Those parents may not be eligible to be reunified with their children, according to the filing, which grouped parents not in the U.S. as either potentially eligible or not eligible. The filing also reported that 879 migrant parents have been successfully reunified with their parents, up from 364 on Thursday, NBC News reported. But 917 parents may not be eligible for reunification at all. A total of 2,551 children between the ages of 5-17 have been taken from their parents at the border, many of them separated under Trump's "zero tolerance" policy that called for the prosecution of all immigrants crossing the border illegally.